CHAOS WAR tie-in! 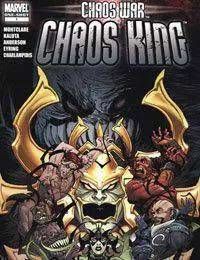 What method or madness lies within the mind of the CHAOS KING? Witness the first strikes of CHAOS WAR here! As darkness blankets the stars, only the gods of Zenn-La, homeworld of the SILVER SURFER, remain to oppose the Chaos King before he begins his march on the final battleground: Earth! And Earth's first line of defense against this unstoppable evil? IMPOSSIBLE MAN!? All this, and the destruction of Hell itself, written by BRANDON MONTCLARE, and brought to life by living legend M. W. KALUTA!